Orvis-Endorsed Wingshooting Guide located near Glasgow, Montana. In Big Sky Country the Prairie of the Great West meets the Sky. The phenomenal habitat creates spectacular unmatched upland bird hunting. Wild birds in truly wild country. Native sharp-tailed grouse inhabiting the country side are plentiful. Hungarian partridge and ring-necked pheasants also thrive in this extraordinary system. The land we explore is associated with one of the largest wild prairie ecosystem in existence today. The landscape provides staples such as snow berries, buffalo berries, and assorted terrestrials that produce a perfect habitat. Your hunt will include meals and accommodations. We provide an experienced guide with trained dogs, transportation in the field and access to thousands of acres of hunting opportunity. Northeast Montana upland areas consist of mixed grass prairie, rolling grassland and stubble fields. The hiking terrain is a moderate grade with occasional hills. Irrigated lowlands and river corridors contain alfalfa fields and brushy creek bottoms. September is generally warm. Many days reach mid 70's and warmer. October is mild with many days in the mid 60's. Fly or drive to Glasgow, MT. Enjoy a filling meal and relax the night before your hunt. We will arrive early in the field each day. Lunch is often served midday near your hunting area. Our guides are happy to tailor each hunt to your level of experience and physical ability. September: Sharptail grouse and Hungarian partridge. October & November: Sharptail grouse, pheasant, Hungarian partridge, and waterfowl. Please bring your own shotgun and ammunition. We prefer break open shotguns for safety. 12-, 16-, and 20-gauge is preferred. You will need clothing for cool and mild temperatures, as Montana weather is unpredictable. Include waterproof and lightweight gear with comfortable walking shoes. 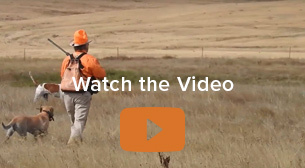 Bring an orange hat or vest, and shooting glasses for added safety in the field. Travel: Plan to fly or drive to Glasgow, MT. Pickup at airport is included. Hunting Dogs: You may bring your own dog. Hunters per guide: We take a maximum of three hunters per guide.